Donald Casturo, Managing Director, Goldman, Sachs & Co, in his opening testimony during the second day of hearings at the CFTC, blew into a familiar horn with respect to speculative actions in trading energy future contracts. Maybe so because of his position as head of trading and managing the commodity index business at Goldman or maybe it was just something that comes with the job as a trader. In his defense Casturo referred to convergence at settlement of a future’s contract price with the spot price in a physically deliverable commodity like oil, as vital to well-functioning futures markets.Therefore prices in the future’s market are determined only by supply and demand fundamentals the same way spot prices are. This makes a lot of sense under normal circumstances but we surely don’t live in normal times. The convergence argument does not take into account that fundamentals are not really that important considering the accommodative stance of the Federal Reserve. Who is going to take the other side when everybody and his cousin are assuming that the Fed will trash the dollar in order to revive an ailing financial industry? By doing so the Fed will increase commodity prices and inflation over the long run. After all that’s what they have done for the last thirty years. From this it clearly follows that future prices can influence spot prices in such a way detached from market fundamentals. Excessive speculation therefore will drive the spot price in the direction of the shape of the futures curve. To pinpoint such a shift away from fundamentals is of course extremely difficult. Speculators seem to say we are innocent until proven guilty, and see their business in trading energy as legal. CFTC and others might not be able to refute it but might recognize their illegitimate actions on the basis of common sense. I hope that the CFTC hearings will help them and the public to acknowledge today’s peculiar situation in energy markets and commodity trading in general and act accordingly as outlined in section 4a of the CEA (Section 4(a) of the Commodity Exchange Act) to protect the public interest. In order to illustrate this point I charted the monthly price of the front month WTI crude oil futures contract (CLU9) including FOMC decisions on the Fed Funds rate since 2006. The last of a series of restrictive steps was implemented in June 2006, FOMC raised interest rates by 25 basis points to 5.25 percent in that month. After that rates were kept steady at that level for more than a year. Over that time period the price of WTI oil was range bound between $60 and $80. In September 2007, two months after two Bear Stearns hedge funds had defaulted, FOMC changed course and lowered their target rate by 50 basis points. During September for the first time ever the price of WTI cut through $80 threshold like a knife through butter. Unprecedented cumulative cuts of 125 basis points in January and 95 basis points in March and April the following year saw similar price jumps in WTI crude oil future contracts. The price of oil kept increasing from about $85 at the end of 2007 to almost $150 in June of 2008 even though the economy was already in a severe recession as determined by NBER since the end of 2007. As one might argue that this was not recognized until many months later, unprecedented actions taken by the Federal Reserve should have proven otherwise. Speculators kept pouring money into commodities and were driving up prices to unsustainable levels. During the CFTC hearing commissioner Bart Chilton was chastising the industry for their go slow attitude and reiterated CFTC’s commitment to swift action. He was particularly concerned with the London loophole and look-alike contracts traded on London futures markets. In the connection with hedge exemptions traders can buy and sell these OTC contracts on unregulated electronic exchanges with almost no position limits attached to them. These contracts were traded outside of the commissions oversight. The policy debate according to Chilton is to find the right balance between the amount of commercial hedging and speculation. Within the CFTC he seems to be the driving force behind stronger regulation. In his statement he acknowledged the commission did not perform its due diligence function with as much zeal as it should have last year. No such words coming from chairman Gensler. In fact there seems to be a rift between Gensler and Chilton on the role speculators played during the commodity bubble of 2008. In last years report CFTC blamed supply and demand fundamentals rather than speculators for the run up in oil prices. Chilton seemed to suggest that this year’s report would deviate from that view, but chairman Gensler merely talked about updating but not necessarily reversing the 2008 findings. CFTC will release the new report next month. Tyson Slocum is Director of Public Citizen’s Energy Program, an organization that supports the public in helping to ensure households have access to competitive priced energy markets. In doing so they are vitally interested in functioning energy markets and fair prices. Public Citizen is neither funded by the government nor by the corporate sector. Slocum’s independence represented the true public view on the issue of energy prices, which should be determined only by supply and demand fundamentals. He suggested to the CFTC to implement: 1) aggregate position limits across all energy products and markets for all index traders, swaps dealers and proprietary traders. 2) increased transparency of OTC contracts and clearing them through a CFTC controlled exchange. 3) investigation of potential market integrity concerns. The Intercontinental Exchange (ICE) according to Slocum operates OTC and Exempt Commercial markets (ECM), both are not effectively regulated by CFTC, yet their overall market penetration has exploded in the last couple of years. ICE’s electronic exchange volume increased 567% from 2004 to 2008 (from 35 million contracts to 237 million) and the company’s OTC platform has seen volume grow 700%, from 31 million contracts in 2004 to 247 million in 2008. Major investment firms like Goldman Sachs, JP Morgan Chase/Bear Stearns, Morgan Stanley, Citigroup and Bank of America/Merrill Lynch invest in commodity index funds by buying huge amounts of energy and other commodities future contracts in OTC markets. The same firms hedge their exposure to these markets in offsetting portfolios of future contracts on regulated exchanges. These hedges are very often exempt from position limits. Since many firms operate index funds and at the same time function as swap dealers they manage to evade CFTC regulation not once but twice through OTC markets and hedge exemptions. GS operates the long only GSCI index fund, with 65% of its 24 commodities being in the energy space and only 25% in agricultural commodities. The CME has a 20000 contracts hedge exemption on the GSCI index fund. When GS radically changed the weighting of the index in the summer of 2006, selling about $6 billion worth of gasoline futures contracts, future prices fell by nearly 10 percent. To gain inside into physical movements of energy products large energy traders like Goldman Sachs are acquiring energy infrastructure assets like pipelines and storing facilities or in some cases even outright oil and gas fields. Highbridge Capital Management, a hedge fund controlled by JP Morgan Chase, bought a stake in oil and natural gas trader Louis Dreyfus Group. As of November 2008 Morgan Stanley paid $452 million to lease storage facilities for 2009. In January 2009, investment banks like Morgan Stanley and Citigroup stored about 80 million barrels of oil in takers at sea. According to a Wall Street Journal report financial speculators were snapping up leasing rights in Cushing, the most important delivery point of physical crude in North America. In August 2006, Goldman Sachs, AIG and Carlyle/Riverstone took over pipeline operator Kinder Morgan for $22 billion, thereby controlling 43,000 miles of crude oil, refined products and natural gas pipelines, in addition to 150 storage terminals. In 2005, Goldman Sachs and private equity firm Kelso & Co. bought a 112,000 barrels/day oil refinery in Kansas operated by CVR Energy. In May 2004, Goldman spent $413 million to acquire royalty rights to more than 1,600 natural gas wells in Pennsylvania, West Virginia, Texas, Oklahoma and offshore Louisiana from Dominion Resources. Goldman Sachs owns a six percent stake in the 375-mile Iroquois natural gas pipeline, which runs from Northern New York through Connecticut to Long Island. In December 2005, Goldman and Carlyle/Riverstone together invested $500 million in Cobalt International Energy, an oil exploration firm. During yesterday’s hearings senator Sanders characterized the situation in the financial industry as heads, bankers win; tails, everyone else loses. Looking at the vast increase in scope of energy specs, their many loopholes in electronic exchanges where thousands of contracts are evading CFTC regulation with the speed of light, or the explosion of hedge exemptions to those very same traders that are fleeing into the dark pools of OTC markets, makes me think he is on to something. The goal has to be to avoid extreme volatility in energy and other commodity prices for the sake of the common good. To achieve this we must implement Tyson Slocum’s suggestions and constitute strict aggregate position limits, close all possible loopholes and absolutely assure market integrity. In the nearby future big investment firms like GS and Morgan Stanley have to make a decision, whether they want to continue their lucrative trading venues or switch to the physical part of the commodity business. Either commercial or non-commercial, we should not allow this huge firms to be both at the same time. It is always a special day when the powerful and mighty are commanded to defend their innocence in front of a panel of congressional judges. The judges are appointed by the American public and form the House Oversight and Government Reform Committee and the defendant is chairman of the Federal Reserve, Ben Bernanke. In question is the alleged role of the Federal government, which the Fed is part of, in the takeover of investment firm Merrill Lynch (MER) by Bank of America (BofA) in December of last year. Some lawmakers accuse the Fed and Bernanke in particular to have Ken Lewis, chairman of BofA, pressured into the deal with Merrill. Earlier this month Lewis testified in front of the same panel and left committee members in doubt about the Fed’s role during the acquisition. After analyzing a number of email conversations between Fed officials, Ben Bernanke and then Secretary of the Treasury, Henry Paulson, one of the key questions for the Fed chairman centered around an email from Jeffrey Lacker, president of the Richmond Fed, about a conversation he had with Bernanke regarding a potential withdrawal of BofA from the Merrill deal on the grounds of a material adverse change (MAC) clause. “Just had a long talk with Ben (Bernanke). Says that they think the MAC threat is irrelevant because it’s not credible. Also intends to make it even more clear that if they play that card and they need assistance, management is gone,” Lacker wrote, according to the sources. In his sworn testimony Bernanke assured the panel that he did not tell BofA’s management that the federal reserve would take action against the board or management if they decided to invoke the MAC clause. 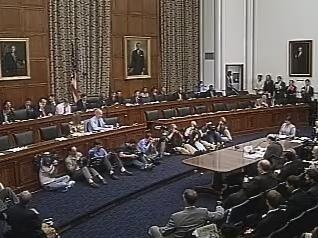 Initially the brisk questioning from lawmakers about the Lacker email seem to physically upset Bernanke. For the most part he denied any accusations and could not recall any details about the conversation. After being asked if he thinks that Lacker is incorrect in his statement Bernanke again stated that he did not know the details of that conversation. Being asked by Congressman Burden if he believes that Mr. Lacker is lying he again insisted that he did not know if he did say these things or not. Annoyed by Bernanke stonewalling the investigation Burden asked him: “Are you sure you cannot remember?”, and the Fed chairman answered: “I am sure that I can’t remember”. After it became known that losses at Merrill would be higher than previously thought CEO Lewis intended to evoke the MAC clause. This provoked the Fed and Bernanke to conclude that BofA exerted a serious lack of due diligence and misjudgment in the course of the deal. Congressman Chaffetz from Utah asked Bernanke if he had the power to replace the board, which he affirmed. Chaffetz continued and asked if claiming misjudgment could not be seen as a threat to BofA, which Bernanke again denied by reiterating that he never said anything about firing the board to Lewis. Congresswoman Kaptur from Ohio touched on an interesting point regarding the relationship of investment firm BlackRock with the Fed in purchasing toxic mortgage related assets. The Fed has several contracts with BlackRock involving programs to purchase and manage a portfolio of toxic mortgage assets the Fed has acquired in the course of diverse bail-outs. Kaptur asked Bernanke if the Fed will support an FBI investigation of BlackRock handling Freddie Mac paper? Bernanke replied that the Fed will certainly not stand in the way if there is an appropriate FBI investigation. The rest of the questions were rather benign. The chairman seemed to be able during this hearing to pull his head out of the noose, at least for this time , but it seems clear that his reputation is bruised. Even if he did not personally press Ken Lewis into this deal he certainly made his wishes been forcefully known. Whether that constitutes an overreach of government power is not clear at this point. It is too early to see if this will impact his reappointment in January of next year. President Obama has already lent his support to Bernanke. Of great interest will be a hearing before the same committee of Henry Paulson and his recollection of the events around the Merrill-BofA deal next month. Few institutions enjoy such powerful position and reputation of the highest order like the Federal Reserve Bank in the US. The men who chaired it like Volcker, Greenspan and now Ben Bernanke are among the foremost economists and most influential people on the face of the Earth. While Greenspan’s role in the crisis, that has destroyed Wall Street and crippled the global economy, has been criticized the bank and its current chairman seemingly were left unharmed. To the contrary in the course of the crisis the Fed’s balance sheet has doubled and tripled and the role as lender of last resort has lifted Bernanke into the status of the almighty savior. That Ben Bernanke is no saint has now even reached into the halls of the US Congress. Last week Lewis CEO of Bank of America, a financial institution hit very hard by the crisis on Wall Street, testified before The House Committee on Oversight and Government Reform to the acquisition of investment bank Merrill Lynch in September of 2008. This panel has now ‘invited’ Bernanke to speak about the government’s role in this acquisition. This time it will be quite different though for the chairman, nothing like any of his scheduled testimonies before members of the House and the Senate. The accusation is serious. According to Lewis government officials threatened to remove BofA’s management if they would step down from the Merrill deal. The House Committee’s questions will focus on numerous emails between Bernanke and other Fed officials from last December. Representative Darrell Issa, a Republican from California, stated at the hearing with Lewis that government officials do not have the power to ‘force shotgun weddings’. The Bernanke hearings will be held on June 25, certainly a day to mark in the calendar. In another development a Congressman from Texas who is a notorious critic of the Federal Reserve has finally won sufficient support for his bill. Ron Paul and 221 of his colleagues signed on to the Fed Transparency Act, which would require a fresh outside audit of the Federal Reserve. It will now go to the Senate and should it pass it would mean for the first time in history sunshine could fall on this mighty institution. We can only chime in and sing in the age of Aquarius ‘Let the sunshine in’. Atlanta Fed President Lockhart in a speech did not mention interest rates today. The markets thanked him for that. The European currency and stock markets around the globe gained. So did oil and gold! In the last paragraph he expressed concern with timely action to rebalance the economy. He seems to be pretty confident though that the Fed is up to the task. Not everybody else is. I do not dismiss these concerns out of hand. I also recognize that the task of pursuing the Fed’s dual mandate of price stability and sustainable growth will be greatly complicated should deliberate and timely action to address our fiscal imbalances fail to materialize. But I have full confidence in the Federal Reserve’s ability and resolve to meet its inflation objectives in whatever environment presents itself. Of the many risks the U.S. and global economies still confront, I firmly believe the Fed losing sight of its inflation objectives is not among them. 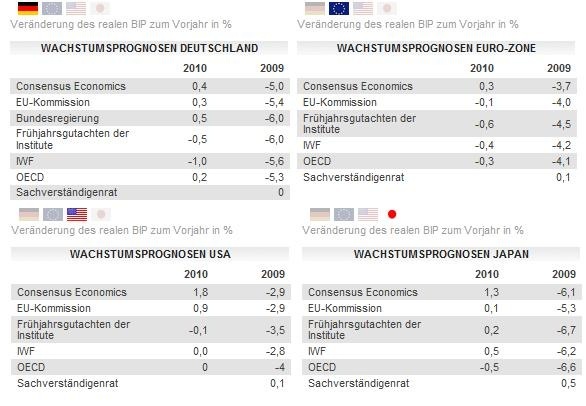 For all those who are concerned about the credit rating of the United States the newest flow of funds data from the Federal Reserve should provide some assurance. 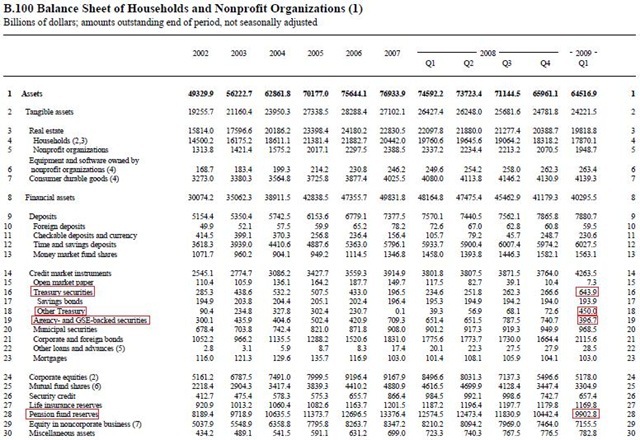 Combined net worth of American households is still at 50.38 trillion US dollar in the first quarter of 2009. The recession has taken a big bite out of American’s fortune. The value of Americans’ stock holdings dropped 5.8 percent from the final quarter of last year. The value of real estate fell also, homeowners had only 41.4 percent equity in their homes left in the first quarter. A slimmer of hope that the severe recession is easing. During the final three months of 2008 net worth shrank by a record 8.6 percent.